Sup – lol I haven’t used that word in ages… can’t decide if it makes me sound gangster, old, or just plain sad. Most probably be the later as i seriously doubt I’ll ever be able to pull ‘gangster’ off. 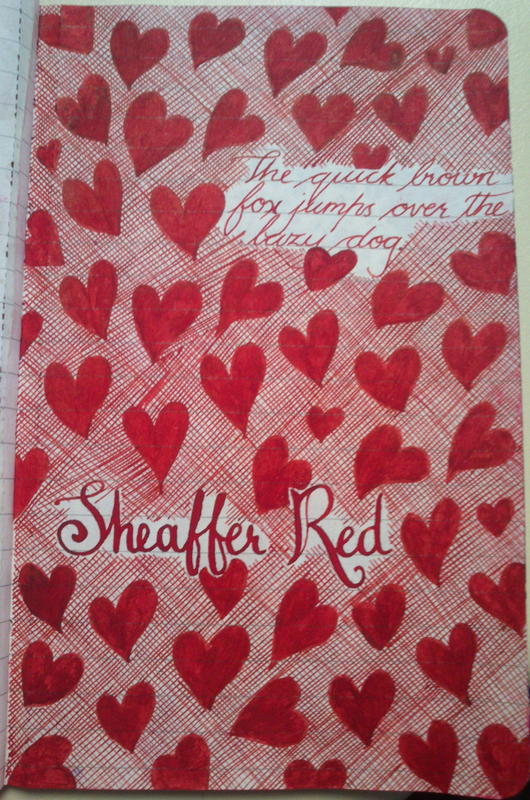 Moving on, today I will be reviewing Sheaffer red – I must say this ink really surprised me. 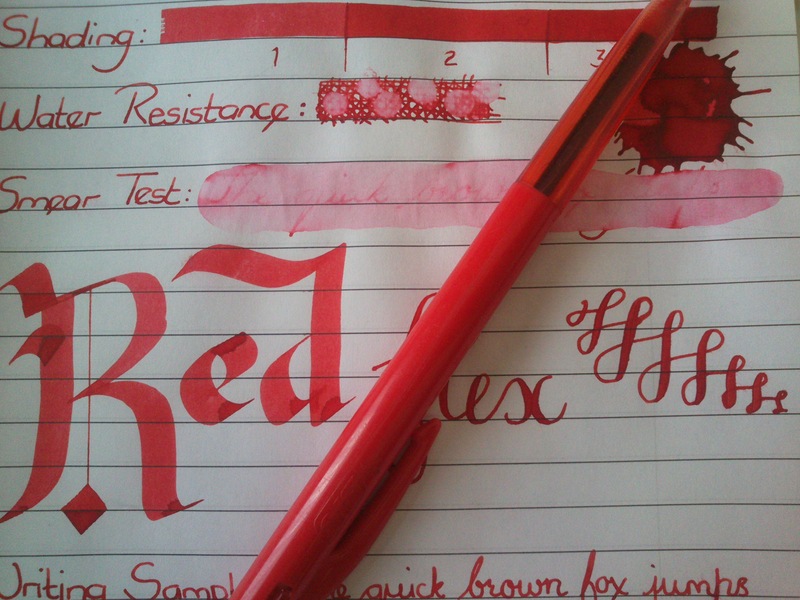 My past experience with reds has been disappointing, before buying a sample of Sheaffer Red I had already tried: Lamy Red, Pelikan Red and Edelstein Ruby and while all of them where technically red, they where not the red I had envisioned. I wanted RED not pink-y red, not orange-y red, not brown-y red. I wanted a pure deep dark saturated red… This ink is defiantly a pure red – not washed out, not pink-y and defiantly not muted. 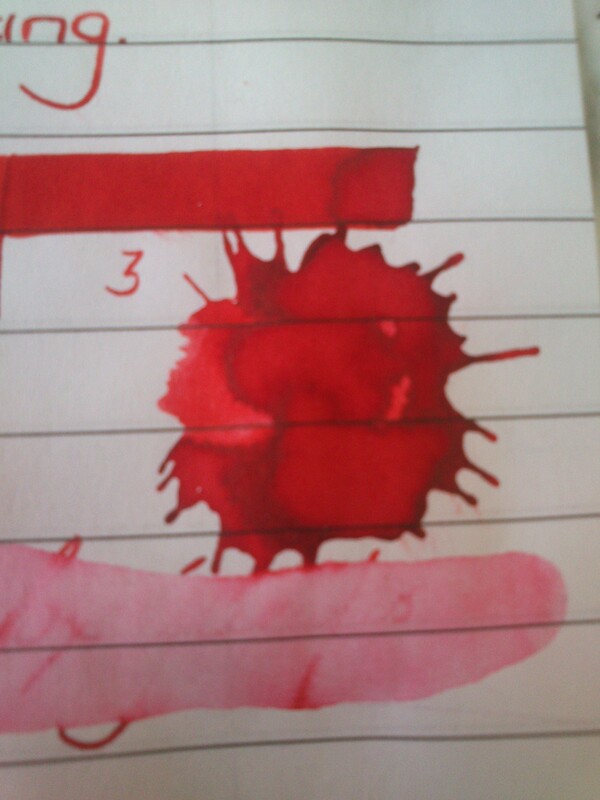 In fact this could be my perfect red if only it was darker – the darkest part of the ink splat is perfection. 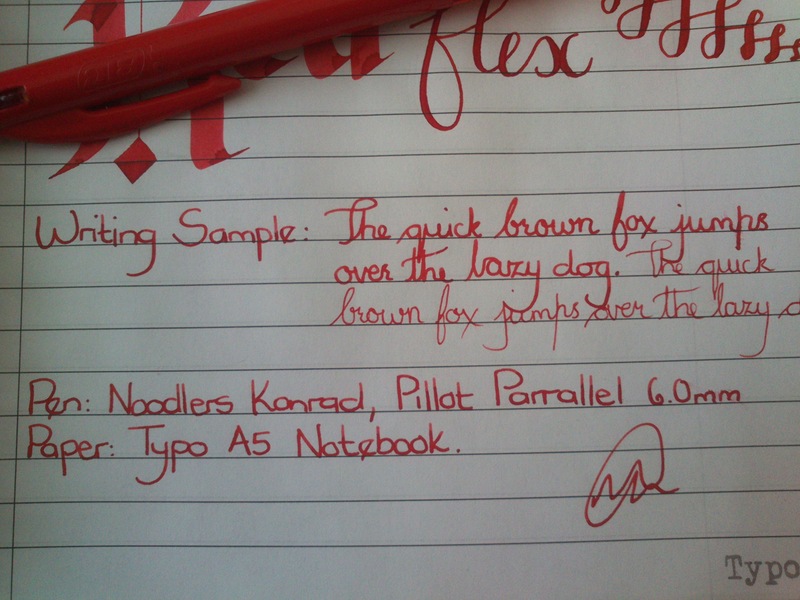 This ink is an almost identical colour to the Red Bic clickable pens. While my personal colour preference veers more to the dark and vampy, if someone where to ask me to pick a red that embodied valentines day – it would have to be this one. Water resistance is non-existent, but on the bright side it was a breeze to clean. 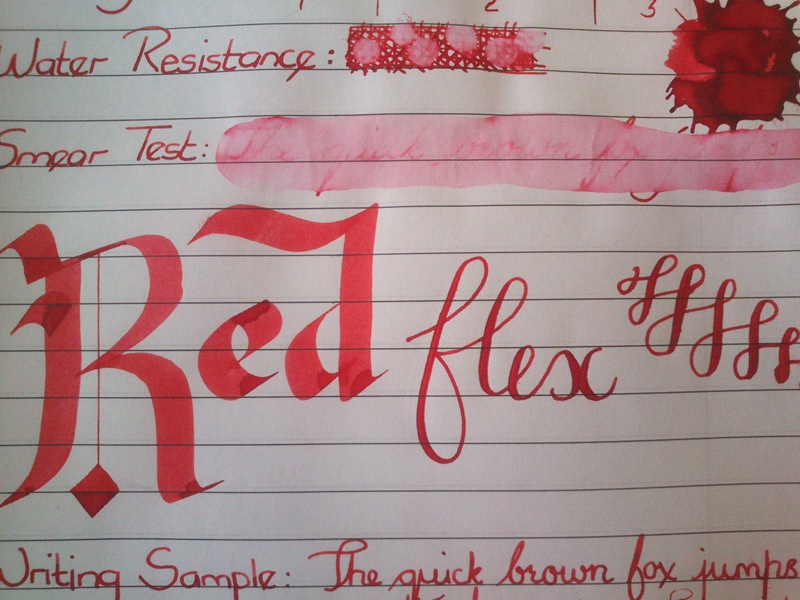 This ink also wrote beautifully – and kept up with my flex writing surprisingly well. I must say Sheaffer may not have many colour options, but every Sheaffer ink I have tried, has been a pleasure to write with and very easy to clean out of my pens. Have you found your perfect red yet? 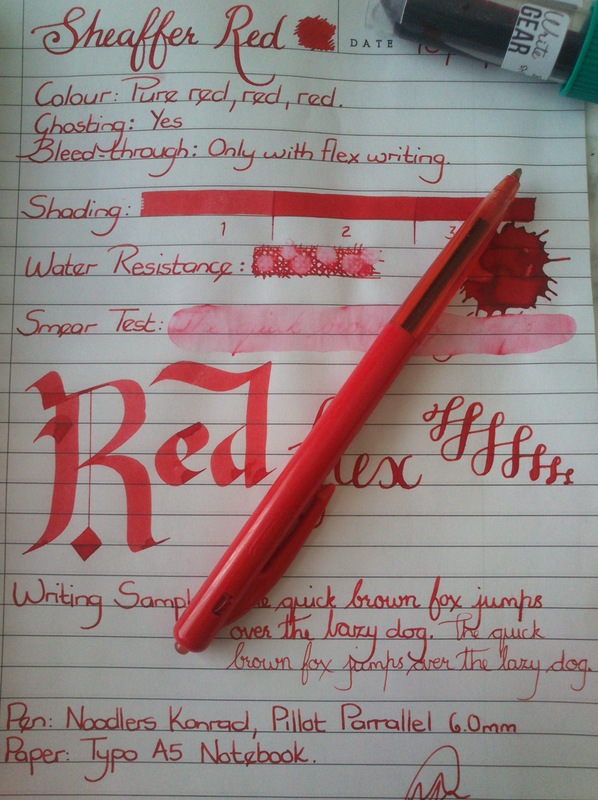 What calligraphy font is the word red in? It’s so beautiful. Also, just getting into pen and ink, and your blog has been such a fabulous reservoir of info.